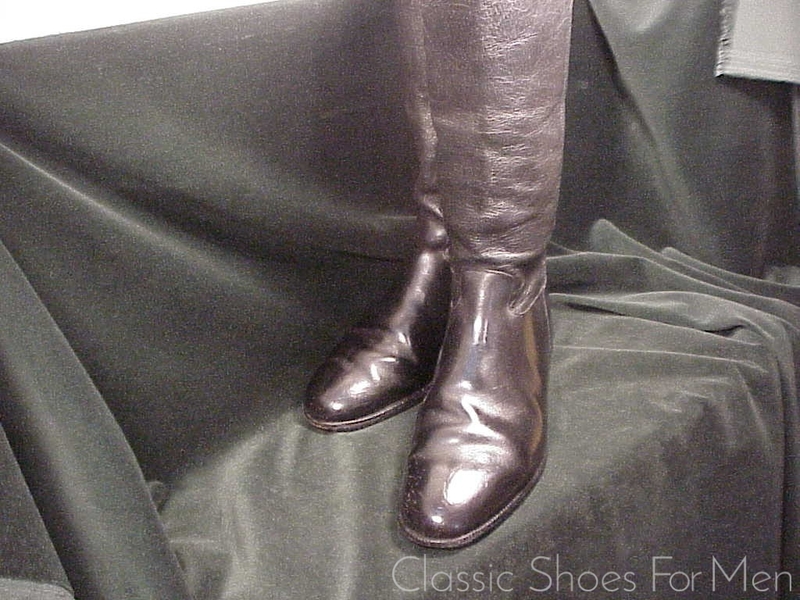 Maker/Marke: Militaria, Peal & Co.
First let us dispel any similarity to Brook Brothers products marketed under the Peal name. 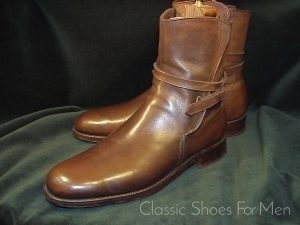 This is a bespoke/custom made boot actually made by Peal & Co. before its dissolution. 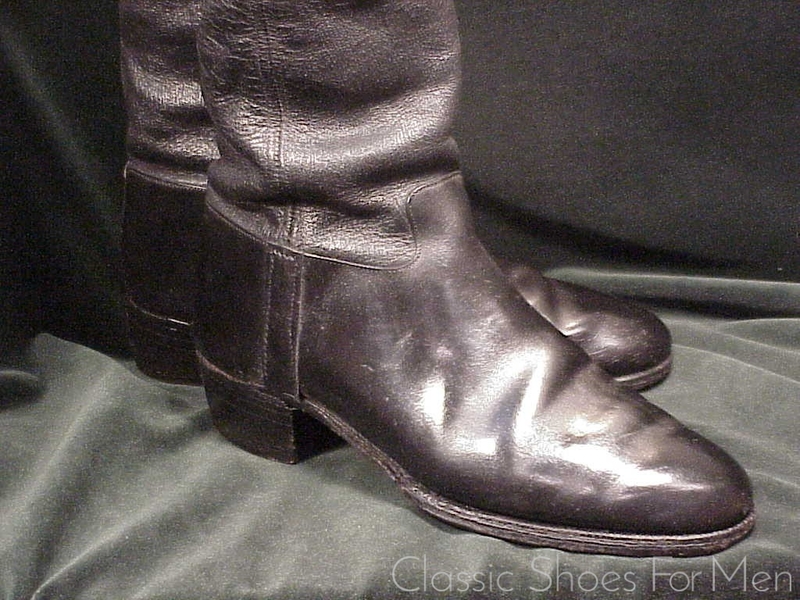 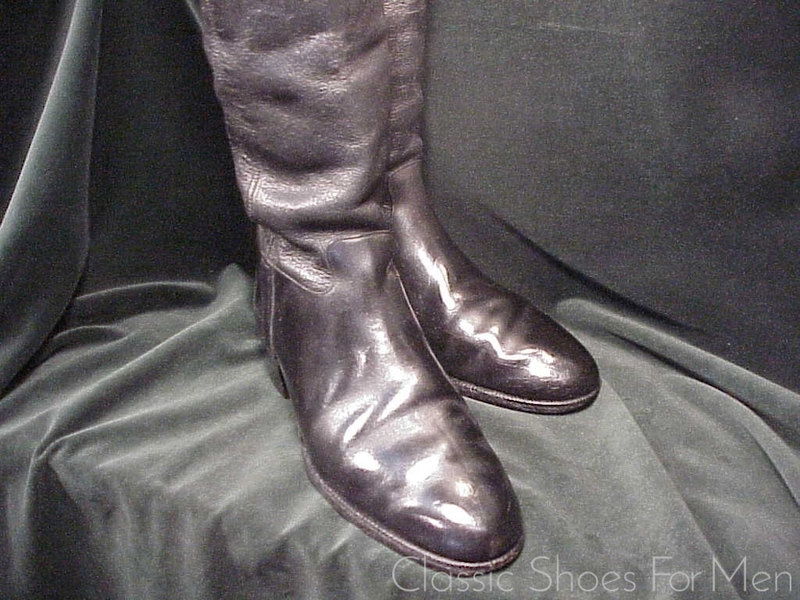 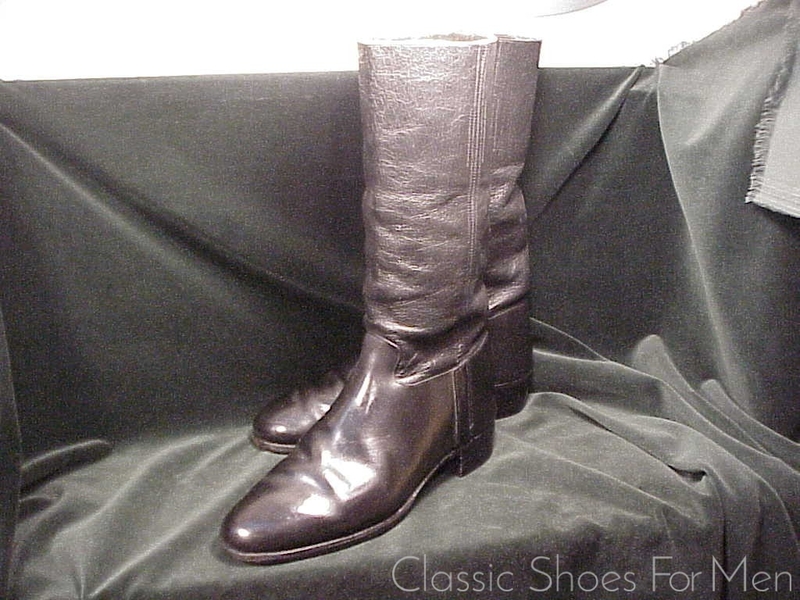 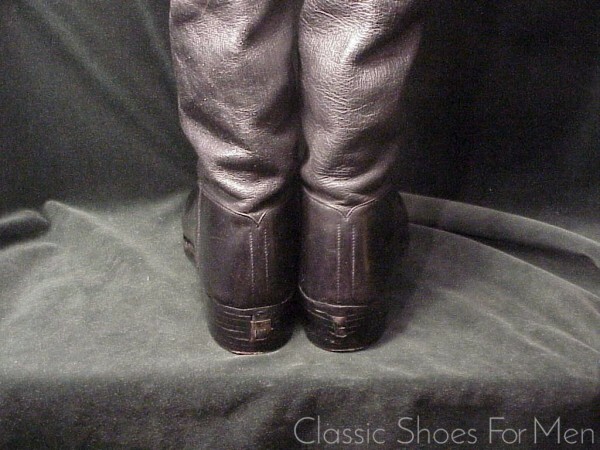 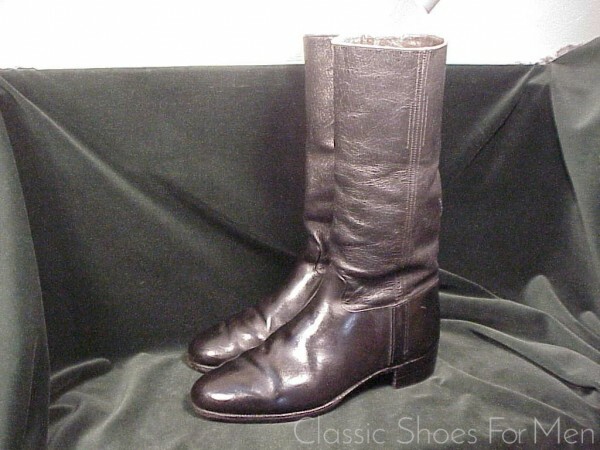 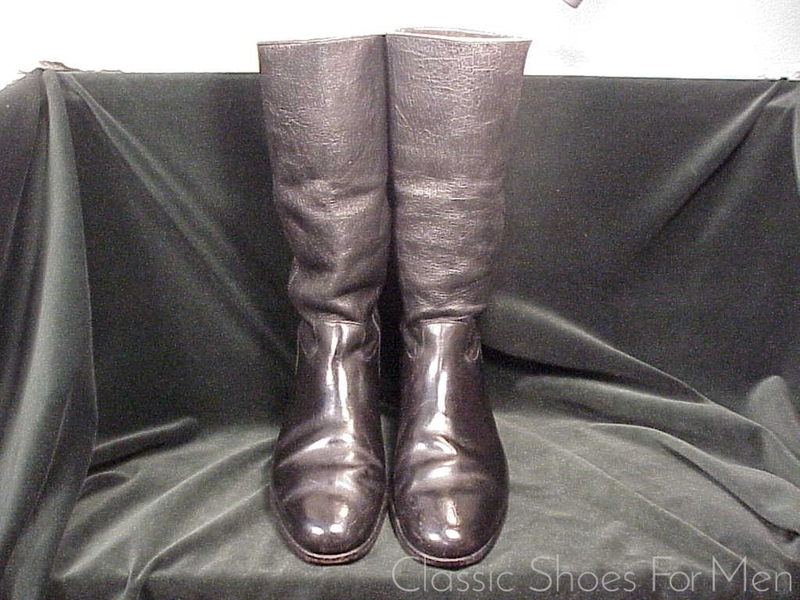 Moreover, the present pair is doubly remarkable for its two leathers rarely in use in the mid-century. 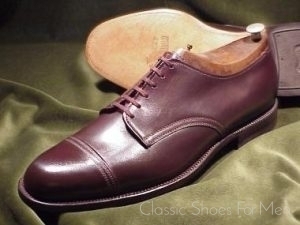 Cordovan was decades away from gaining popularity in England or on the Continent and the few Cordovan shoes from the period are all custom made. 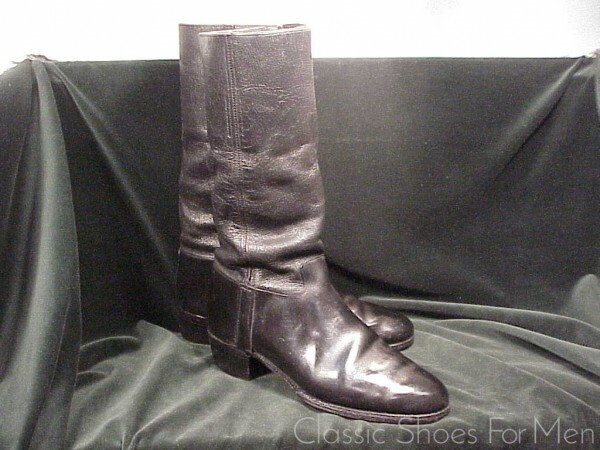 Antelope is as rare today as it was then, I see one or two Wellington Boots a year but this is the only pair in Antelope I have seen in my entire career. 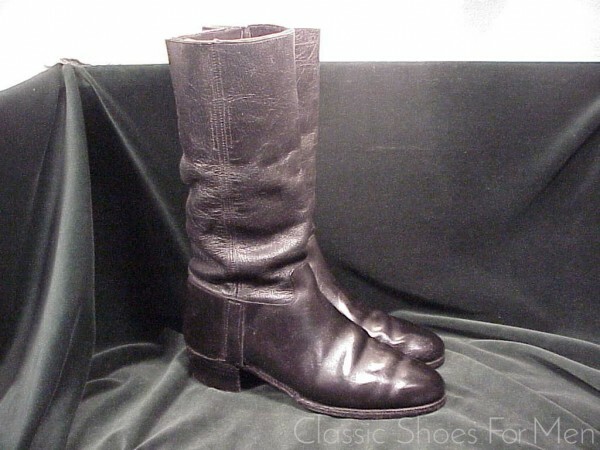 It is very likely that the gentleman-officer for whom these boots were custom made provided the hide to Peal himself, a souvenir from shooting game in Africa. Please notice the spur-jacks in the heels; many regiments wore spur to formal dinners. 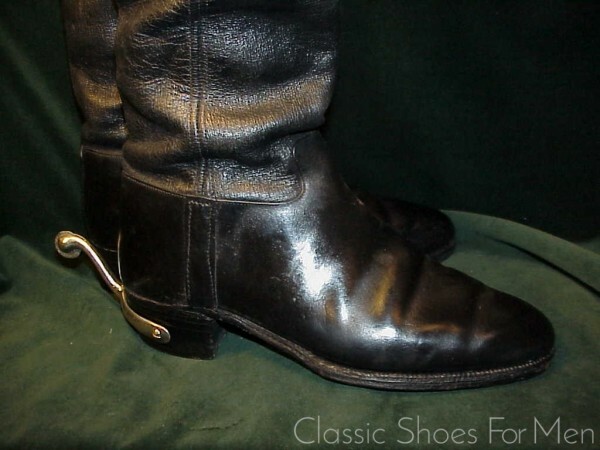 (Spurs provided separately; please inquire.) 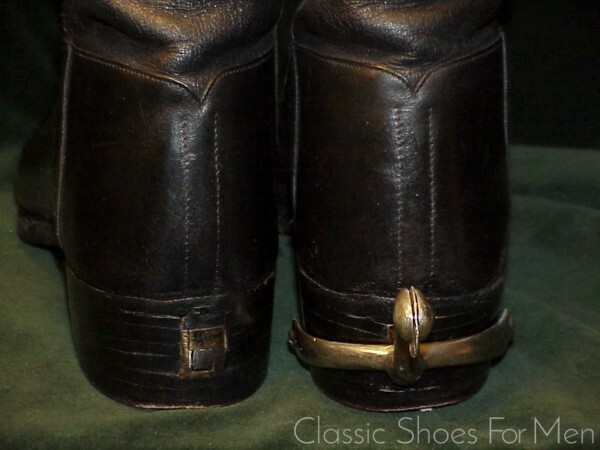 Finally, it would be fair to say this is an extremely rare item, something for the collector but eminently wearable for formal or casual dress, with or without the removable spurs, an elegant design, handsome worn under or over trousers. History of the firm: “Peal and Co were founded in 1565 and were the oldest-established and most successful makers in the world, employing up to 200 staff. The firm was established in Durham and moved to Derby in 1765, reaching London in 1791. 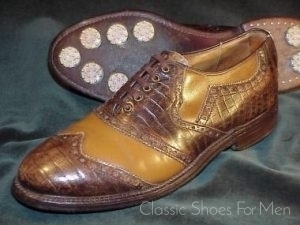 In 1953 Peal bought their Oxford Street neighbours, Bartley and Son, inheriting their Boot and Fox emblem and moved to Wigmore Street in 1958. 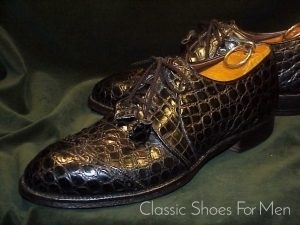 The business closed early in 1965, when the family decided that lack of family succession, a declining trade and shortage of skilled staff made closure their best option. 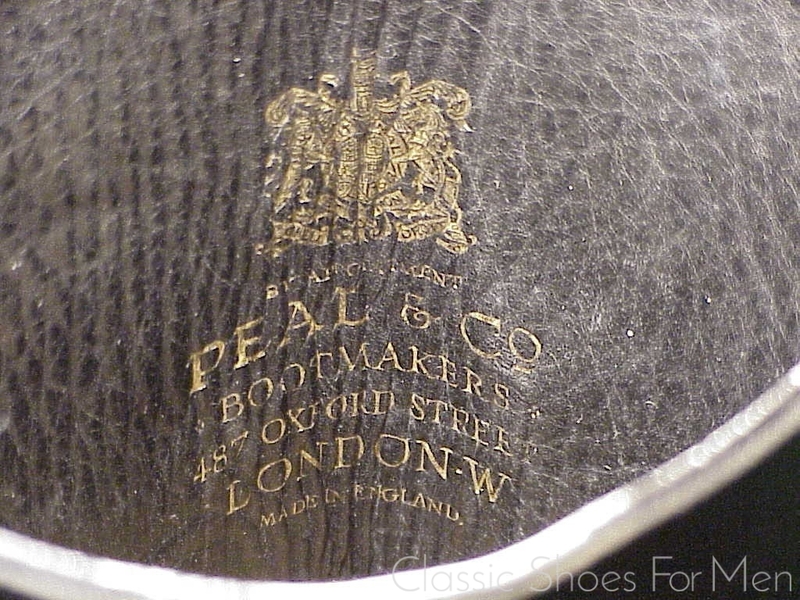 The closure of Peal and Co was very helpful to the remaining shoemakers in London including Foster and Son, who acquired two important assets, the boot and fox emblem and Mr. Terry Moore, Peal’s master last maker. The old Peal lasts are still said to be in use by Foster & Son. 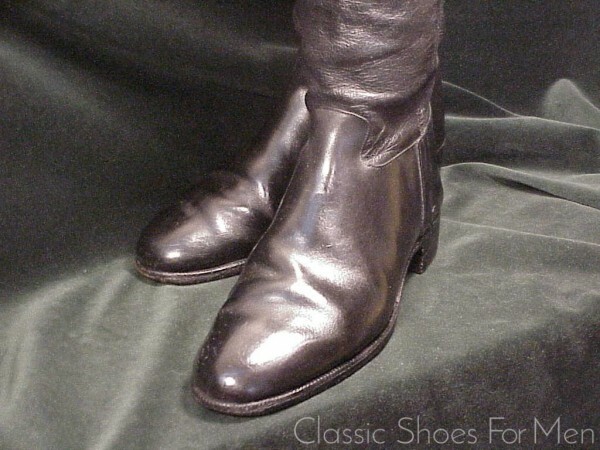 By my precise measurement using shoemaker's lasts of known size: UK 9E.....US 10D.....Continental 43-43.5D, for the medium width foot. 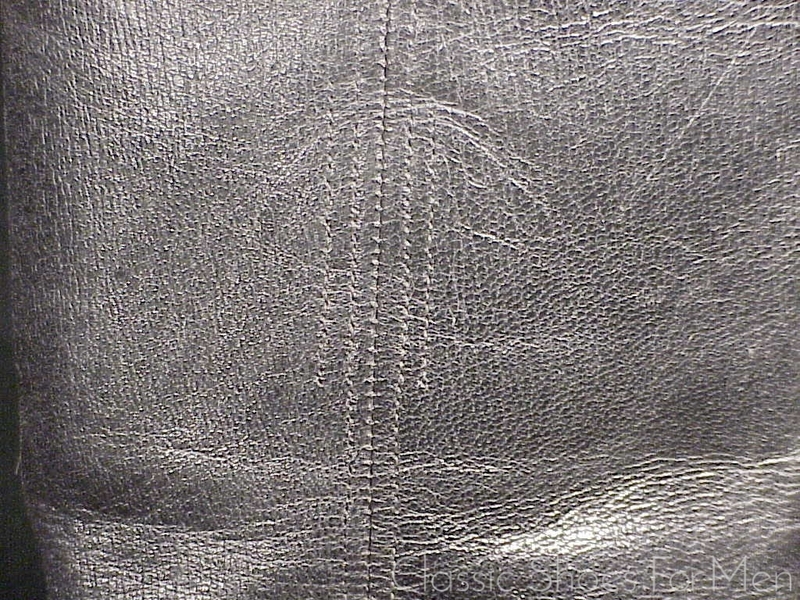 Near new, showing trivial wear.